Renowned as one of Australia's, indeed the world's, most beautiful seaside holiday destinations, Queensland's Sunshine Coast region of Noosa is set on a headland and surrounded by stunning National Parks and golden beaches. Home to an excellent surf beach and a range of boutique shopping and fine dining options on famous Hastings Street, Noosa is a popular holiday destination with local and International visitors alike. 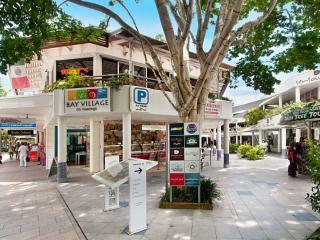 Noosa is recognised for its high end shopping, cuisine and accommodation and offers a number of luxury hotels and resorts however the wide range of Noosa accommodation ensures there is something available to suit all tastes and budgets. The self-contained holiday apartments and units are ideal for extended stays and the charming bed and breakfasts of the hinterland offer an intimate and unique atmosphere. All of Noosa's accommodation enjoys a great range of amenities and facilities including expansive swimming pools, fitness centres, onsite dining options, day spas and more and are conveniently located close to a range of local activities and attractions. Despite its reputation as a lifestyle holiday destination home to boutique shopping, fine dining, luxury resorts, deluxe day spas and beach paradise, a visit to Noosa is well within the budget when choosing Noosa holiday packages. By bringing together everything from flights and accommodation to transfers, meals, tours and travel insurance you can save time and money. Offering discounted rates as well as bonus extras like room upgrades, massage vouchers and more, Noosa holiday packages allow you to book everything in one go and then just sit back, relax and enjoy your holiday with the peace of mind that everything is taken care of. Indulgence and relaxation are top of the agenda in Noosa with spectacular National Parks to explore and dolphins and whales to spot off shore. The famous Hastings Street offers a huge stretch of boutique shopping and fine dining to enjoy while the newly renovated Surf Club offers a more laid back spot to enjoy a meal or quiet drink when you take in the fantastic beachfront views. Just 90 minutes from Brisbane, Noosa is easily accessible by road or air and lends itself perfectly to day trips and extended stays. Its convenient location also sees it within close proximity to a number of local attractions and activities including Australia Zoo, the Eumundi markets, SEA LIFE Sunshine Coast and more. Noosa is also the gateway to Fraser Island where you can explore the native flora and fauna of the largest sand island in the world.